The Sun provides the light and heat to make life possible on Earth. It is powered by a process known as nuclear fusion, in which atomic nuclei of light elements smash together and “fuse,” releasing large amounts of energy. For decades, scientists have tried to replicate fusion on Earth. Fusion power is an ideal source of energy. Unlike fossil fuel, fusion does not produce air pollution or greenhouse gases. It is also safer than conventional nuclear power plants. Fusion reactors cannot melt down like Chernobyl or Fukushima did. Fusion does not generate long-lived fissile elements or radioactive waste. Many are trying to build a net energy-producing reactor, Tri-Alpha, General Atomics, to name a few. The governments around the world have spent billions of dollars over the last several decades on advancing the basic science that the startups leverage today. Over the last several years, the venture community has committed well over a billion dollars in investment in an attempt to reach the goal using the latest computing models and superconductors to build powerful magnets to contain plasma. It is important to note that none of these startups are focused on designs that generate heat transfer needed for practical power generation. They are focused only on achieving net energy, i.e. generating more power than they produce. The science underlying fusion is well established. With respect to fusion reactor design, you need to meet three conditions: temperature, fuel density, and confinement time. This is known as the Lawson Criteria. To meet the requirements for “ignition,” the state of producing enough heat to self-sustain the reaction, scientists say the triple product of the three conditions should exceed a value of 5 x 1021 m-3s keV. Similarly, the relative output of a fusion reactor is described by the Q value, which is the ratio of power produced over the power consumed. In order for a reaction to self-sustain, a Q value of 5 is needed. This article discusses the fundamental physics behind the triple product and the challenges of fusion reactor design. The Sun, along with the stars and 99% of the visible universe, is composed of hot plasma, one of the four states of matter. Plasma is a superheated gas of atoms that are ionized. The electrons are separated from the atom’s nuclei, which are positive particles that repel each other. This is not unlike the repulsion when the positive ends of two magnets are brought together. At 15 million degrees C and enormous gravitational pressure within the stars, the nuclei in the plasma move fast enough and are held together long enough to overcome their natural repulsion. By colliding and fusing hydrogen nuclei at a sufficient rate, mass is converted to energy by Einstein’s equation E=mc2, whereby energy = mass x (speed of light)2. The power generated sustains a burning plasma and radiates light from the Sun. Magnetic confinement reactors – The plasma fuel is held in isolation using magnetic fields and heated to around 100 million degrees using pulses of radio and microwaves. The Tokamak reactor is the most common magnetic confinement design studied today. Invented by Soviet physicists Andrei Sakharov and Igor Tamm, the Tokamak traps plasma in a donut or torus-shaped vacuum chamber using a combination of magnets that coil around the torus. A second set of magnets centered on the axis of the torus adds a poloidal or vertical magnetic field that gives the field in the torus a twist. This prevents plasma from escaping by pulling ions that drift outside of the ring back to the center. Because the Tokamak requires strong magnetic fields of several Teslas (about 100,000 times stronger than Earth’s magnetic fields), superconducting magnets are used for all large-scale reactors. They are cooled down to 4 degrees K using helium based cryogenics. One focus of Tokamak development is the use of high-temperature superconducting materials. This increases the magnetic field strengths to improve confinement, which scales with the fourth power of the magnetic field. This not only improves stability to the plasma, it can shrink the reactor size by one-tenth. At higher temperatures, less expensive alternatives to helium driven cryogenic systems can be used to cool the superconducting magnets. Inertial confinement reactors – Pelletized fuel containing frozen hydrogen is heated and compressed using high powered lasers. The most prominent of these projects is the National Ignition Facility (NIF) at the Lawrence Livermore National Laboratory (LLNL). The NIF was completed in March 2009 at a cost of $3.5 billion and funded by the US Department of Energy (DOE).Using 192 of the world’s most powerful lasers, the experimental reactor can deliver 500 terawatts (TW) of light over a few billionths of a second to a pellet of frozen deuterium-tritium couple millimeters in diameter. In 2014, NIF reached a milestone of releasing double the energy absorbed by the pellet. In spite of the progress, the DOE has reassessed the NIF program and has refocused the priority to determining the “efficacy of reaching ignition” by 2020. Z-pinch reactors – Another type of fusion is the Z-pinch, which takes concepts from both magnetic and inertial confinement. In a Z-pinch device, an electrical current is shot through plasma that is confined to a magnetic field. The electrical discharge causes the plasma to compress to densities and temperatures that enable fusion. The largest such device is the Z machine at Sandia National Laboratory.While the Z machine has received the bulk of funding for Z-pinch based fusion, there is increasing attention to study the phenomena on a smaller scale. The US Advanced Research Projects Agency-Energy (ARPA-E) is now supporting projects to explore low-cost methods of Z-Pinch using pulsed power or piston-driven compression. The agency is funding nine teams for a total of $30 million under its ALPHA program. What fuels are used for fusion? A number of different elements can combine to produce energy through fusion. With respect to providing energy, the most feasible reaction is the binding of deuterium and tritium, two heavier forms of hydrogen. The deuterium nucleus has one additional neutron and the tritium nucleus has two additional neutrons. The fusion of deuterium and tritium produces a heavier helium nucleus (alpha) and a free neutron, along with energy in the form of heat. 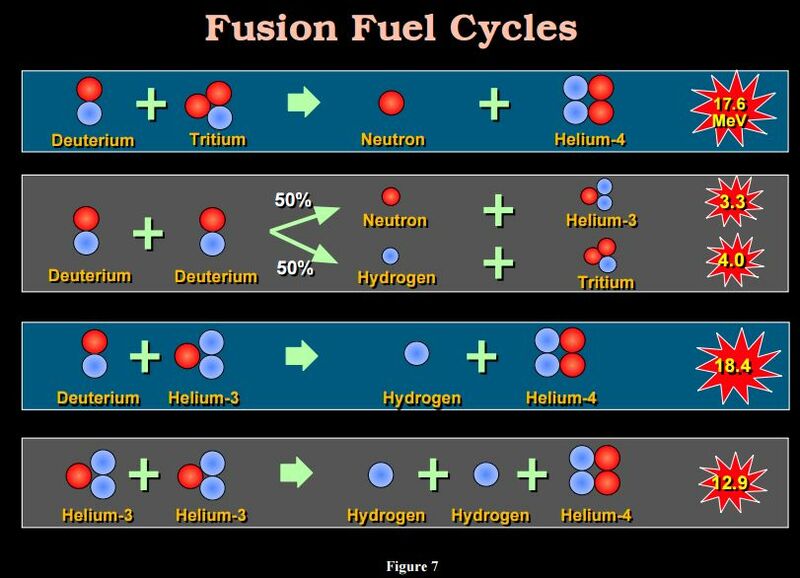 The combined weight of the fusion products is slightly smaller than that of the two nuclei before fusion, accounting for the mass that is converted into energy. How much energy does fusion produce? Fusion releases nearly four million times more energy than the combustion of fossil fuels and four times that of nuclear fission. A half ton of D and T fuel is sufficient to power a 1 GW generator for one year. In contrast, a coal plant with the same output requires 2.5 million tons of coal. A nuclear power plant with similar capacity would need 200 tons of uranium fuel. Where does fusion fuel come from? Deuterium is naturally abundant in seawater (30 grams per cubic meter) and is obtained by splitting the water with electricity. On the other hand, naturally occurring tritium, which has a radioactive half-life of 12 years, is extremely rare. It is produced or “bred” by bombarding lithium atoms with neutrons. Tritium is also produced as a byproduct at nuclear power plants. At the Fukushima Dai-ichi plant, the water used to cool the damaged reactors is contaminated with tritium. According to Japan’s Nuclear Regulation Authority, 57 mL of tritium water are diluted in 770,000 tons of water and stored in 1000 tanks next to the plant. Although the water is essentially safe at these concentrations, the government has yet to give final approval to release the water into the sea. Tokamaks have outperformed all other fusion reactor designs in terms of the triple product. The consensus in the scientific community is that this design will eventually produce net positive energy. Over 200 tokamaks have been constructed to date with successive reactors reaching higher values of Q. In 1997 scientists at the Joint European Torus (JET) in the UK achieved 16 MW of fusion power with 25 MW of input power, equivalent to a Q value of 0.64. The JET reactor is the largest Tokamak to date and is part of a trend towards reactors with larger radii and volumes that produce higher energy outputs. In contrast to the JET program, small experimental reactors also play an important role in fusion development. In 2016, MIT’s Tokamak based Alcator C-Mod reactor set the record for highest plasma pressure at nearly twice that of Earth’s atmospheric pressure, demonstrating high magnetic field materials that improve fusion reactor output. The EU, Japan, India, Korea, China, Russia, and the United States are part of the $22 experimental billion International Thermonuclear Experimental Reactor (ITER) in France. It will be the world’s largest tokamak using deuterium-tritium fuel. Although ITER will not capture the heat to produce electricity, it is the first fusion reactor that plasma physicists believe will demonstrate net energy on a commercial scale. Once fusion temperatures are attained, ITER is expected to use 50 MW of electricity to produce 500 MW of energy (Q = 10) for pulses of 400 s. Although the ITER facility will be completed in 2019, full power output is not expected before 2035. Plasma stability – While the magnetic fields in a tokamak are effective at confining plasma, it can not do so for more than few seconds due to the inherent unevenness of the magnetic fields. These instabilities are analogous to the bubbles in boiling water. They reduce the plasma temperature needed to sustain fusion. Pulsed operation – Tokamaks work in limited pulse mode, similar to that of a transformer. At this stage of development, the pulses are on the order of seconds. Future reactors are expected to have pulses of hours. They cannot be operated continuously because to drive the plasma, the reactors are inductively driven by the vertical coils. Structural integrity – Every pulse of the reactor places stress on the structure of the power station. The neutrons from the fusion reaction will also damage the structure of the reactor, including the superconducting magnets, if not sufficiently shielded. Cryogenics – In order for the superconducting magnets to operate, they must be cooled down to around 4 degrees K. To reach those temperatures, helium is used as the coolant but it is in short supply and expensive to procure. Not all magnetic confinement reactors use the torus shape of the Tokamak. One variant is the Stellarator, which is designed to address the plasma instability of the Tokamak. In a Stellarator, the magnets are shaped and looped in a manner that gives the magnetic field a steady-state profile. It was not until recently that computing power was fast enough to model the optimal shape of the magnetic coils. The Wendelstein 7-X, which is the first large-scale optimized Stellarator, was completed in 2015. By 2021, the machine is expected to achieve 30 minutes of continuous operations, which unlike the pulsed Tokamaks would demonstrate the feasibility of a fusion plant in continuous operation. How can fusion research drive innovation other fields? Fusion research, specifically in large reactors like ITER, is costly and policy makers continue to debate the level of support it should get. There is a widespread notion that “fusion power is only 30 years away and always will be”. In spite of doubts that fusion could become economically viable, research is driving innovations in medicine, industry, and the environment. These include medical isotopes for imaging and enhanced resolution of magnetic resonance imaging using high-temperature superconducting magnets. The neutrons emitted from fusion reactors can be applied for remediating radioactive wastes. John Holdren, former science advisor to the Obama Administration, argues that fusion is the only technology that will allow long-distance space travel at some fraction of the speed of light.